There’s a lot of familiar faces atop the practice charts and 500 laps means you’re going to want a few laps led to join your top-finishing team. As always, I’ll help and remember… I will be right eventually. Below are some drivers to keep in mind when filling out your DFS lineups. As always, you will see some questionable names amongst the usual suspects as the sport heads to Martinsville. Also, with only 0.1 points awarded for each lap led by a driver, the need for a dominator is less important when building a winning lineup. The 500-lap race will only have a total of 50.0 points up for grabs in this category. Take note when building your roster and focus on mid-pack competitors who can climb up toward the front on race day. Here are a few drivers to keep an eye on for Sunday’s race…. Believe it or not, Truex has never won at this .526-mile paper clip. Last fall’s bump-and-run with Joey Logano was the latest in a series of close calls for a driver still seeking his first MENCS short track victory. But don’t be fooled by his win total. Truex has not finished outside the top five at Martinsville since April 2017 and has not finished outside the top 20 since 2014. Did I mention who was fastest in 10-lap, 20-lap and 30-lap averages on Saturday? The driver of the No. 19 SIRIUS XM Toyota, of course. Truex starts at the tail end of the top 10 (ninth) and will gain positions right from the drop of the green flag. He’s a must to have in your lineup and also a dark horse to earn the win on Sunday. Ole Dennis is quite fast once again in Martinsville (fifth in qualifying). Hamlin’s home away from home has probably filled his living room with clocks that drives his family wild. His five career MENCS victories here are easily the most for him at any racetrack. But I bet he would be willing to add to that prestigious collection Sunday. Sixth in 20-lap averages and fifth in 30-lap averages in practice, Hamlin is good on the long run which is where it counts in southern Virginia. He always finds a way to the front at Martinsville and I wouldn’t expect this week to be any different. I am pretty sure we all remember the excitement Clint, Booga, Brett and little Cash all shared with us last year in this race and I am also positive the driver of the No. 14 wants to rekindle that feeling this week. Fourth and third in 20-lap and 30-lap averages, respectively, Bowyer has brought speed back to this speedway. It was here where he ended a years-long winless streak with an impressive victory in spring 2018. If anybody has the drive and the need for a win, it’s Bowyer. 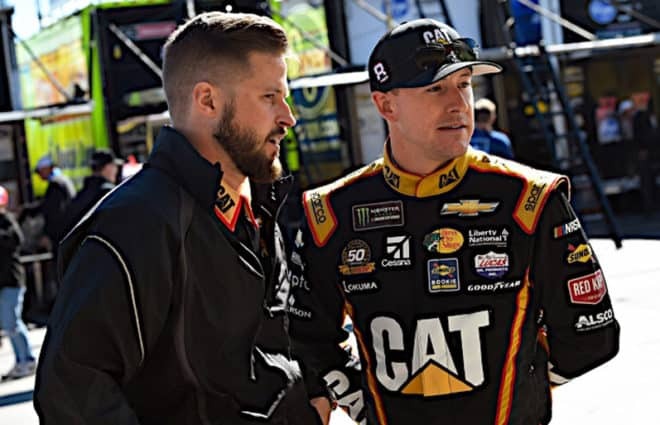 Sunday is a great opportunity for him to play catchup to his Stewart-Haas Racing teammates. No rookie does that well at Martinsville in their first start but I have a hunch about the No. 8 team. Hemric starts near the back (29th) and is also a cheap pick at $6,500. I believe it would be beneficial to snag a guy like him up at this price. Keep in mind Hemric has some past Martinsville experience, too; five Gander Outdoor Truck Series starts here have produced one top-10 finish. DiBenedetto has never had any luck at all in Martinsville. His best run is a 29th-place effort way back in 2016; the underdog has struggled to capitalize on what makes this track an equalizer. But the driver’s move to Leavine Family Racing has seemed to pick up performance overall this season. DiBenedetto was quite fast in practice and will probably run a few spots ahead of where he starts (22nd). Look for a solid 15th-to-20th-place type run for the No. 95 team. No appealing picks this week. Stay $6,000 and above!